As professional Port Macquarie to Darwin removalists, it is our foundation of knowledge & experience that gives us the ability to satisfy every clients requirements from start to finish, whether it is furniture removals, vehicle transport, your delicate piano or back-loading removals. We understand that word of mouth is by far the most powerful advertising and marketing tool, and this is why we take pride in continually providing the best interstate furniture removalist services, to every client, at the best costs possible. I just wanted you to know how happy I was with your service and the price was very good. The friendly and helpful staff at Roadways Removals were excellent. I found your company via a Google search. I obtained quotes from several different companies and found the quote you gave me to be around $300 cheaper than the other quotes I received which is always a nice way to start.The office staff I dealt with were very quick to reply to any queries I had and were extremely helpful, they called several times throughout the moving process to let me know how far away they were. I could also see that the furniture removalists took care with the more fragile items as well. Thank you very much, Ali. 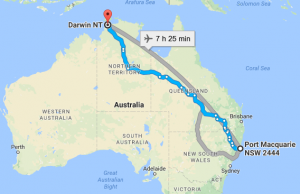 It is for this reason that our Port Macquarie to Darwin removalists continue to excel and why Roadways Removals is the best choice as your interstate removalist.